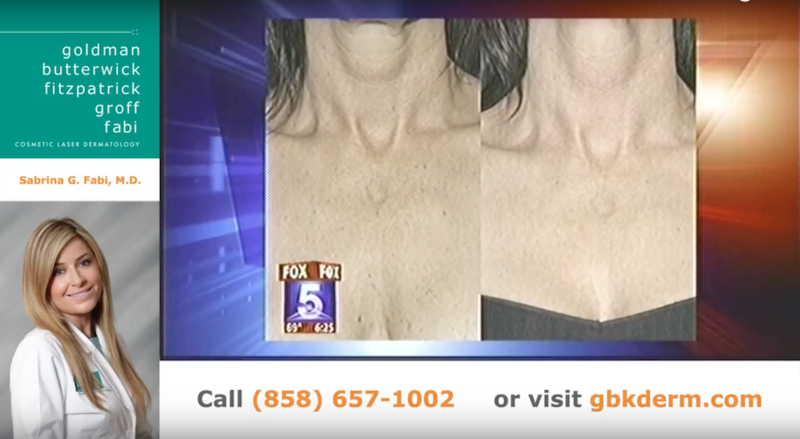 Originally from Chicago, international speaker, trainer, author and medical correspondent for Fox5 News San Diego, Dr. Sabrina Guillen Fabi, MD, is an internationally recognized leader in cosmetic dermatology. She is a double board-certified dermatologist and dermatologic cosmetic surgeon and is an assistant clinical professor at the University of California, San Diego. 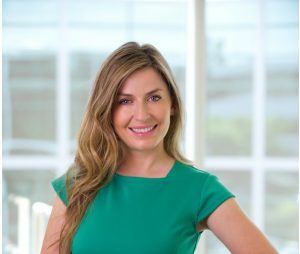 As the associate research director at Cosmetic Laser Dermatology, she is actively involved in multiple injectable, laser, and sclerotherapy clinical studies, including Phase III FDA clinical trials. Dr. Fabi is considered a leading authority on Ultherapy and has pioneered many of its current applications, including its combination with other injectables and laser treatments to achieve a natural 3-dimensional rejuvenation on both the face and body. 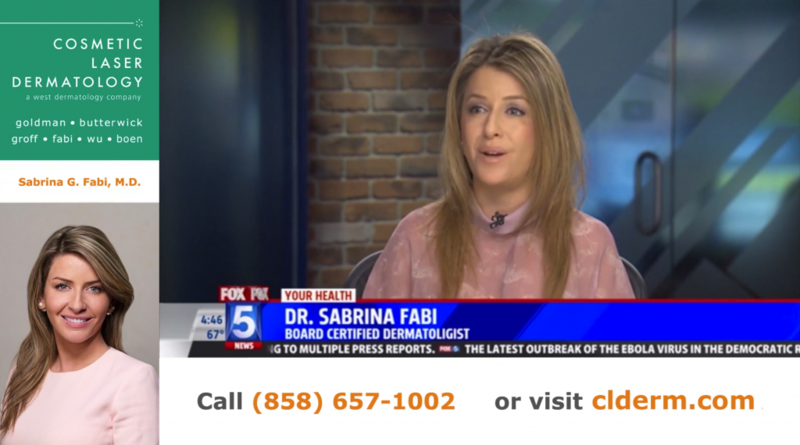 Dr. Fabi believes in looking and feeling your best at any age and helps her patients achieve this through combining state of the art technology with the most up to date medical evidence, an advanced skill set, and an artistic eye. When you see Dr. Fabi, expect to be educated so that you are empowered to make the best decision when it comes to your face and body. She was presented with the Robert W. Goltz Excellence in Teaching Award, for excellence in educating her peers, by the University of California, San Diego. Dr. Fabi has authored over 100 medical articles, in addition to co-authoring 20 book chapters on various topics including cosmetic injectables, intense pulsed light, lasers, liposuction, cellulite, skin tightening and cosmeceuticals. As both a national and international cosmetic dermatology expert, Dr. Fabi has lectured in both Spanish and English in over 30 countries to over 80,000 doctors on aesthetic dermatology advancements pertaining to skin tightening procedures such as Ultherapy, vein treatments, fillers, neuromodulators, laser technologies, and body contouring. Dr. Fabi educates other physicians on various cosmetic procedures and also serves as a trainer in advanced injection techniques for Allergan (the maker of Voluma, Volbella, Kybella, Botox, and Juvéderm) and Galderma (the maker of Sculptra Aesthetic and Restylane Silk), and serves on the Global Faculty for Merz Aesthetics (the makers of Belotero, Radiesse, and Xeomin). She also serves as a mentor for dermatology residents across the country through the Women’s Dermatologic Society and American Society of Dermatologic Surgery and as a preceptor for the American Society of Laser Medicine and Surgery. She is a medical correspondent on Fox News and has appeared numerous times on the Latin-American television network Univision to educate the Latino population on cosmetic medical advances, as well as the CBS show “The Doctors” and Australia’s Studio 10. Her expertise is often sought after by numerous media outlets, including Vogue, Elle, Harpers Bazaar, Redbook Magazine, Teen Vogue, People, Dr. Oz Magazine, New You Magazine, Latina and La Raza. Dr. Fabi was born and raised in Chicago. Experiencing childhood bad eczema and cystic young adult acne, Dr. Fabi recognized early the power such superficial conditions can have on one’s self esteem and was inspired to go into a profession where she can help people look and feel better. She obtained her medical degree and graduated at the top of her class at the University of Illinois at Chicago College of Medicine, where she stayed to complete her residency training in dermatology. Further cosmetic surgery training included the completion of a fellowship through the American Academy of Cosmetic Surgery. Her early interest in medical research took her to Mali, Africa through a program sponsored by the National Institutes of Health, where she contributed in the research and development of the malaria vaccine with the hopes of serving a deprived population. Her continued interest in global dermatologic conditions also led her to spend time at the National Skin Centre in Singapore. She has received numerous investigative and leadership accolades including the Cutting Edge Research Grant through the American Society for Dermatologic Surgery (ASDS), Young Investigators Writing Competition, and the ASDS Future Leaders Network. Dr. Fabi enjoys being philanthropic in the community by volunteering her time to increase skin cancer awareness through programs like the Skin Cancer Foundation “Road to Healthy Skin Tour,” ASDS free skin cancer screens, complimentary breast cancer tattoo removal through ASLMS, and pro bono scar treatments through the Wounded Warrior program as well as annually donating and fundraising at the practice for the Susan G. Komen Race for the Cure in San Diego. Dr. Fabi has also been named a “Top Contributor” on the medical information site RealSelf! Dr. Fabi loves cosmetic dermatology, and in her free time devotes time to teaching colleagues all over the world on injectables, lasers, and devices, so that collectively they participate in keeping patients looking natural while helping them look more refreshed. Outside of work, Dr. Fabi enjoys spending time with her friends and family, traveling, reading, and doing Pilates. Being of Hispanic descent, Dr. Fabi is fluent in Spanish. To view Dr. Fabi’s complete curriculum vitae, please visit here. 2006 – University of Illinois College of Medicine • M.D. 2013 Consultant and Speaker Bureau, Biopelle, Inc.
2012-present Global Consultant,& Speaker Bureau, Ulthera Inc.
2012-present Trainer & Speaker Bureau, Allergan, Inc.
"Dr. Sabrina Fabi is amazing! She has transformed my face into a new prettier me with a natural look that I love. People have told me I look younger than my older photos and it is all due to Dr. Fabi. Thank you for the amazing work!" "Wow! I look so refreshed, and years younger than I did in my before photos. Amazing results! Love it. Thanks again, Dr. Fabi!" "I trust Dr. Fabi to my core. I look young, feel great, and receive compliments on how young I look all the time." "I love and appreciate the professionalism, knowledge, warmth and extraordinary care from Dr. Sabrina Fabi and her team at Cosmetic Laser Dermatology. I could not be in better hands!" "Thank you so much Dr Fabi for making me feel comfortable about myself and also confident. You are the best." 1. Guldbbake K, Guillen S, Khachemoune A. Idiopathic Scrotal Calcinosis. Skin & Aging. 2005 Oct; 100-2. 3. Janjua SA, Guillen S, Khachemoune A. Tuberculosis verrucosa cutis presenting as an annular plaque. Family Medicine. Hartford, CT: The Core Content Review of Family Medicine, 2005.
treatment of erythema nodosum leprosum. J Drugs Dermatol. 2009 Aug: 8(8):765-9. 9. Stevenson, A, Fabi, SG. Cutaneous Leishmaniasis. Skin & Aging. 2010 Nov; 46-50.
retrospective study of 28 cases using a 5-point chest wrinkle scale. Cos Derm 2011 June. Injections with Intralesional Normal Saline. Cos Derm. 2011;24:278-284. 12. Schmitt, C, Fabi, SG, Kukreja T, Feinberg J. Hypopigmented cutaneous sarcoidosis responsive to minocycline. J Drugs Dermatol. 2012;11(3):385-9. Leg Veins: Double-Blind, Prospective Comparative Trial between Polidocanol and Hypertonic Saline. Derm Surg. 2012; 38(7Pt2): 1208-16. Cosmet Dermatol. 2012; 11(3): 229-34. 1,550 nm fractionated laser and topical bimatoprost. Derm Surg. 2012; 38(7 Pt 1):995-1001. 18. Fabi SG, Goldman MP. Hand Rejuvenation: A Review and Our Experience. Derm Surg. 2012;38(7 Pt 2):1112-27. 21. Hamman S, Fabi SG, Goldman MP. Comparison of two techniques using hyaluronic acid to correct the tear trough deformity. J Drugs Dermatol. 2012:1;11(12):e80-4. 23. Edwards AF, Massaki A, Fabi SG, Goldman MP. Clinical Efficacy and Safety Evaluation of a New Monopolar Radiofrequency (mRF) Device with Comfort Pulsed Technology for the Treatment of Facial Skin Laxity: 10 month experience with 64 patients. Derm Surg. 2013;39(1 Pt 1):104-10. 24. Fabi SG, Cohen J, Peterson JD, Kiripolsky MG, Goldman MP. The Effects of Filtrate of the Secretion of the Cryptomphalus Aspersa (SCA) on Photoaged Skin. J Drugs Dermatol. 2013 Apr;12(4)453-7. 26. Fabi SG, Maas, C, Goldman MP. The Efficacy, Safety, and Patient Satisfaction of an Injectable Hyaluronic Acid with 0.3% Lidocaine Hydrochloride, for the treatment of Superficial Perioral Lines and/or Superficial Lateral Canthal Lines. Derm Surg. 2013 Oct 9. 27. Draelos Z, Lupo M, Gold M, Goldman MP, Fabi SG. Efficacy of Hydroquinone Free Skin Lightening Cream for Photoaging. J Cosmet Dermatol. 2013;12(1):12-7. 28. Fabi SG, Massaki A, Sasima E, Goldman MP. Evaluation of the Microfocused Ultrasound System for Lifting and Tightening the Decolletage. JAAD. 2013 Dec;69(6):965-71. 30. Fabi SG, Sundaram H, Guiha I, Goldman MP. A Two-Center, Open-Label, Randomized, Split-Face Study to Assess the Efficacy of One Versus Three Intradermal Injection Sites of AbobotulinumtoxinA in the Treatment of Lateral Periocular Rhytides. J Drugs Dermatol. 2013;12(8):932-7. 31. Goldman MP, Fabi SG, Bruce S, Callendar V, Roberts, Chiu E, Foad, A New Innovation for the Management of Hyperpigmentation: A roundtable discussion on Novel Management Strategies for Hyperpigmentation. November 2013. Dermatology Times, Supplement. 32. Fabi SG, Goldman MP. Comparative study of hydroquinone-free and hydroquinone-based hyperpigmentation regimens in treating facial hyperpigmentation and photoaging. J Drugs Dermatol. 33. Friedmann D, Mahoney L, Fabi SG, Goldman MP. A Pilot Prospective Comparative Trial of High-Intensity Focused Ultrasound Versus Cryolipolysis for Flank Subcutaneous Adipose Tissue and Review of the Literature. Am J Cosm Surg. 2013; 30 (3): 152-8. 34. Fabi SG, Metelitsa A. The Future of Cutaneous Laser Therapy. Clin Dermatol. 2014 Jan;32(1):61-9. 35. Wu DC, Friedmann DP, Fabi SG, Goldman MP, Fitzpatrick RE. A comparison of two light-based protocols for the rejuvenation of the chest. Derm Surg. 2013 Dec 19. doi: 10.1111/dsu.12398. 37. Darling, MD, Peterson JD, Fabi SG. Impending Necrosis Following Injection of Hyaluronic Acid and Calcium Hydroxylapatite Fillers: Report of 2 Cases and Review of Management, Including Hyperbaric Oxygen Therapy. Hyperbaric Oxygen. Derm Surg. 2014. Jul 30. 39. Friedmann D, Fabi SG Goldman MP, Combination of Intense Pulsed Light, Sculptra, and Ultherapy for Treatment of the Aging Face. J Cosmet Dermatol. 2014;13(2):109-18. 40. Fabi SG, Sundaram H. Facial Plastic Surgery is: Potential of Topical and Injectable Growth Factors for Aesthetic Applications. Facial Plast Surg. 2014 ; 30(2):157-71. 41. Friedmann D, Goldman MP, Fabi SG, Guiha I. The effect of multiple sequential light sources to activate aminolevulanic acid in the treatment of actinic keratoses. J Clin Aesthet Dermatol. 2014 Sep;7(9):20-5. 42. Fabi SG. Microfocused Ultrasound with Visualization for Skin Lifting and Tightening: A Review and My Experience. Derm Surg. 2014;40 Suppl 12:S164-7. 43. Dayan SH, Fabi SG, Goldman MP, Kilmer SL, Gold MH. A Prospective Multicenter Pilot Study of the Safety and Efficacy of Micro-focused Ultrasound with Visualization for Improving Lines and Wrinkles of the Décolleté. Plast Reconstr Surg. 2014 Oct;134(4 Suppl 1):123-4. 46. 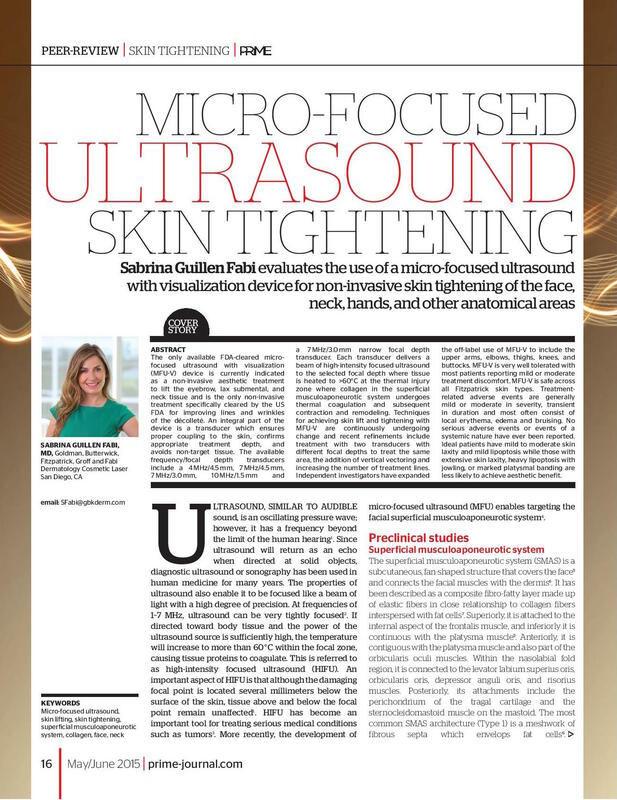 Fabi SG, Goldman MP, Dayan S, Kilmer S, Gold M. A Prospective Multicenter Pilot Study of the Safety and Efficacy of Micro-focused Ultrasound with Visualization for Improving Lines and Wrinkles of the Décolleté. 2015 Mar;41(3):327-35. 47. Woodward J. Fabi SG. 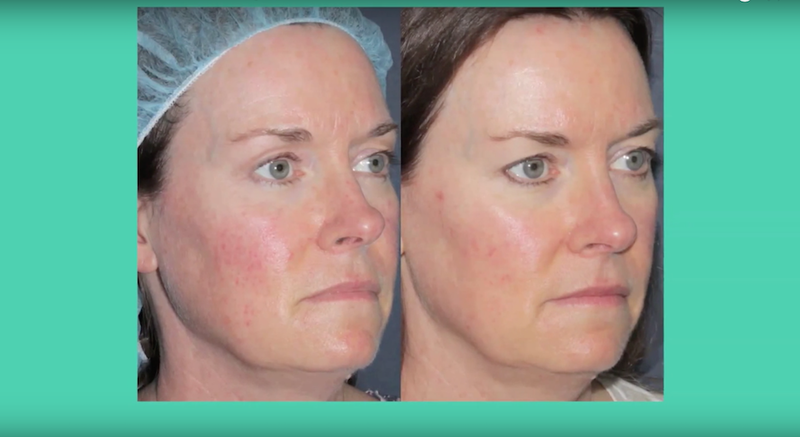 Alster T.,Combining MFU-V and Fractionated CO2 for Optimal Skin Tightening and Lifting. Derm Surg. 2014 Dec;40 Suppl 12:S190-3. 48. Fabi SG, Non-invasive Skin Tightening: Focus on New Ultrasound Techniques. Clin Cosmet Investig Dermatol 2015 Feb 5;8:47-52. 49. Carruthers J, Fabi SG, Weiss R. Monopolar Radiofrequency for Skin Tightening. Derm Surg. 2014;40 Suppl 12:S168-73. 50. Fabi, SG. Micro-Focused Ultrasound Skin Tightening in the Face and Neck. Prime: International Journal of Aesthetic and Anti-Ageing Medicine. 2015. 54. Fabi, SG. Laser-assisted Drug Delivery: The Future of Laser Surgery. Prime: International Journal of Aesthetic and Anti-Ageing Medicine. Oct 2014. 56. Hart D, Fabi SG, White M, Fitzgerald B, Goldman MP. Current Concepts in the use of PLLA: Clinical Synergy noted with combined use of HFUS and PLLA on face and decollete. Plast Rec Surg. 2015; 136(5 Suppl):180S-7S. 59. McDaniel DH, Hamzavi IH, Zeichner JA, Fabi SG, Bucay VW, Harper JC, Comstock JA, Makino ET, Mehta RC, Vega VL. Total Defense + Repair: A Novel Concept in Solar Protection and Skin Rejuvenation. J Drugs Dermatol. 2015 Jul 1;14(7):s3-s11. 60. Fabi, SG, Carruthers J. A single modality approach to rejuvenate the aging face and body: A thing of the past? Derm Surg 2016. May;42 Suppl 2:S73-S76. 61. Vanaman M, Fabi SG, Carruthers J. Complications in the Cosmetic Dermatology Patient: A Review and Our Experience, PART I. Derm Surg. 2016 Jan;42(1):1-11. 62. Fabi SG, Mills D, Green J, Weiss R, Werschler WP. 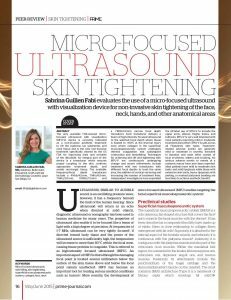 Combining Microfocused Ultrasound With Botulinum Toxin and Temporary and Semi-Permanent Dermal Fillers: Safety and Current Use. Dermatol Surg. 2016 May;42 Suppl 2:S168-S176. 63. Vanaman M, Fabi SG, Carruthers J. Complications in the Cosmetic Dermatology Patient: A Review and Our Experience, PART II. Derm Surg. 2016 Jan;42(1):12-20. 65. Vanaman M., Fabi SG, Cox SE. A Combination Approach to Enhance and/or Rejuvenate the Neck – A Review and Our Experience. Dermatol Surg. 2016 May;42 Suppl 2:S94-S100. 66. Fabi, SG, Massaki AN, Goldman MP. Clinical Efficacy and Safety of Monopolar Radiofrequency Device with Comfort Pulse Technology for the Treatment of Facial and Neck Laxity in Men. SkinMed June 1;14(3):181-85. 67. Carruthers J, Burgess C, Day D, Fabi SG, Goldie K, Kerscher M, Nikolis A, Pavicic T, Rho N Rzany B, Sattler G ,Sattler S, Seo K, Werschler P, Carruthers A. Consensus Recommendations for Combined Aesthetic Interventions in the Face Using Botulinum Toxin, Fillers, and Microfocused Ultrasound with Visualization. Dermatol Surg. 2016 May;42 Suppl 2:S168-S176. 69. Larsen L, Fabi SG, McGraw T, Taylor M. A Multi-modality approach to optimize the improvement of Acne Scars. Derm Surg 2016. Dermatol Surg. 2016 May;42 Suppl 2:S139-S149. 70. Vanaman, M, Bolton J, Placik O, Fabi SG. Keeping it tight: Nonsurgical female genital rejuvenation. Derm Surg May 2016. 71. Narukar V, Fabi SG. Bucay V, Tedaldi R, Downie J, Zeichner J, Butterwick K, Taub A, Kadoya K, Makino E, Mehta R, Vega V. Rejuvenating Hydrator: Hyaluronic Acid Homeostasis with Instant Clinical Benefits. J Drugs Dermatol. J Drugs Dermatol. 2016 Jan 1;15(1):s24-37. Tighten up: what works in skin tightening, Moderator & Speaker. Annual Meeting of the American Society of Dermatologic Surgery. New Orleans. November, 2016. An update on Sclerotherapy and Endovenous Vascular Closures. Masters of Aesthetics. San Diego 2016. Safely and Effectively Treating Ethnic Skin. Masters of Aesthetics. San Diego 2016. Live patient demonstrations – hand injection, lip injection and chest injection. Vegas Multispecialty Meeting Las Vegas, June 2016. Minimally Invasive Chest Rejuvenation. Vegas Multispecialty Meeting, Las Vegas, June 2016. Non-Invasive Body Contouring And Skin Tightening – Hype Or Hope – Time To Invest? Vegas Multispecialty Meeting, Las Vegas, June 2016. “Plastic Surgery Practice” Nonsurgical And Surgical Management Of The Neck- Which Procedure Works Best For which patient. Vegas Multispecialty Meeting, Las Vegas, June 2016. Fillers For Non-Facial Areas. Vegas Multispecialty Meeting, Las Vegas, June 2016. Full-Face Rejuvenation with Injectables and Energy-Based Tissue Lifting: Treatment Challenges of the Lower Face Paradigm Medical Communications, World Congress of Dermatology. Las Vegas, June 2016. Full-Face Rejuvenation with Injectables and Energy-Based Tissue Lifting: Treatment Challenges of the Lower Face Paradigm Medical Communications, World Congress of Dermatology. Chicago, May 2016. Full-Face Rejuvenation with Injectables and Energy-Based Tissue Lifting: Treatment Challenges of the Lower Face Paradigm Medical Communications, World Congress of Dermatology. Costa Mesa, April 2016. Shark Tank: Clear & Brilliant Pelo. Annual Meeting of the American Society of Dermatologic Surgery. Chicago. October, 2015. Tighten up: what works in skin tightening, Moderator & Speaker. Annual Meeting of the American Society of Dermatologic Surgery. Chicago. October, 2015. Fillers – What’s Available and What’s on the Horizon. Annual Meeting of the American Society of Dermatologic Surgery. Chicago. October, 2015. Putting it all together: Safe and Effective Mega Combination Treatments for Body Rejuvenation. Annual Meeting of the American Society of Dermatologic Surgery. Chicago. October, 2015. Satisfying the patient demand with 3-Dimensional Rejuvenation. Annual Meeting of the American Society of Dermatologic Surgery. Chicago. October, 2015. A retrospective evaluation of subsurface monopolar radiofrequency for lifting and tightening of the face, neck and body. Annual Meeting of the American Society of Dermatologic Surgery. Chicago. October, 2015. Evaluation of the Ulthera® System for the Reduction of Buttock Ptosis. Annual Meeting of the American Society of Dermatologic Surgery. Chicago. October, 2015. Changes in Skin Laxity Among ATX-101 Treatment Responders in the REFINE Trials. Annual Meeting of the American Society of Dermatologic Surgery. Chicago. October, 2015. Fillers – What’s Available and What’s on the Horizon. ASDS Regional Meeting – Advanced Injection Techniques: Maximize Safety and Minimize Complications. New York, New York. September 2015. Safe and Effective Treatment Combinations for Natural Looking Results. American Academy of Facial Plastic Surgery. Dallas, TX. September 2015. What Really Works for NonSurgical Skin Tightening/Lifting and The Skinny on Fat Melting and Freezing. American Academy of Facial Plastic Surgery. Dallas, TX. September 2015. Complications, so you had a bad day, Moderator. New Derm Live. Los Angeles, California. September 2015. Stop Following and Lead. New Derm Live. Los Angeles, California. September 2015. Can You Really Have it All, Moderator. New Derm Live. Los Angeles, California. September 2015. Tips for Periocular Perfection: The Nonsurgical Approach. COLCOME III SYMPOSIUM. Bogota Colombia, August 2015. 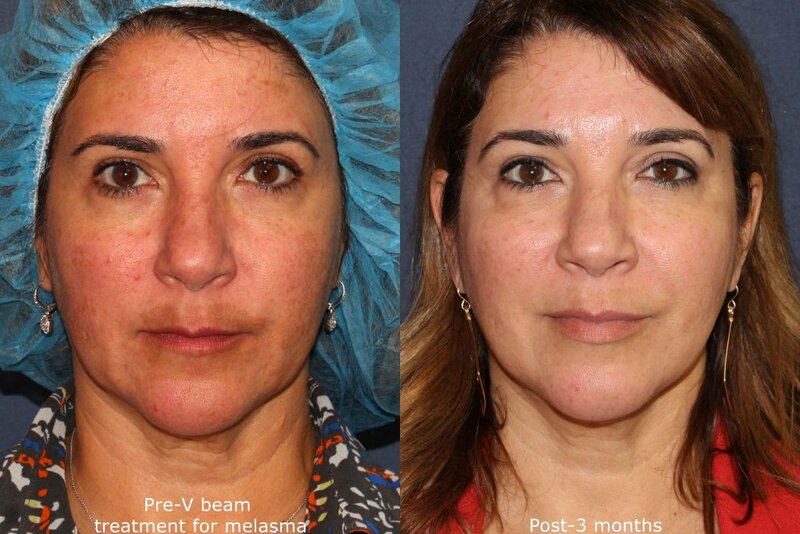 A two-center retrospective evaluation of patient satisfaction, efficacy and longevity using low volumes of 20mg/mL HA gel (VYC-20L) for mid-face volumization. COLCOME III SYMPOSIUM. Bogota Colombia, August 2015. Putting it all Together: Energy Based Treatment Combination for a Natural Looking Result. COLCOME III SYMPOSIUM. Bogota Colombia. August 2015. Laser Assisted Drug Delivery. COLCOME III SYMPOSIUM. Bogota Colombia. August 2015. Nonsurgical Body Contouring. COLCOME III SYMPOSIUM. Bogota Colombia. August 2015. Lasers and Fillers for Body Rejuvenation. COLCOME III SYMPOSIUM. Bogota Colombia. August 2015. Skin Care/Rejuvenation, Moderator – Vegas Multispecialty Meeting, Las Vegas, NV. June 13th. The Skinny on fat melting and freezing techniques- Vegas Multispecialty Meeting, Las Vegas, NV. June 13th. Minimally Invasive Chest Rejuvenation – Vegas Multispecialty Meeting, Las Vegas, NV. June 13th. Skin Tightening and Lifting Procedures: What Works and When to Consider Using This Technology – Las Vegas, NV. June 13th. What is on my bathroom counter and why? – Vegas Multispecialty Meeting, Las Vegas, NV. June 12th. Top cosmeceuticals and Upcoming Ones as well as Update on Current Hand Held Devices – Vegas Multispecialty Meeting, Las Vegas, NV. June 11th. Fillers for Nonfacial areas – When, Where, and how? – Vegas Multispecialty Meeting, Las Vegas, NV. June 11th. Periocular Perfection: The Nonablative Approach. American Society of Dermatologic Surgeons. World Congress of Dermatology. Vancouver. June 8th, 2015. Putting it all Together: Energy Based Treatment Combination for a Natural Looking Result. American Society of Dermatologic Surgeons. Resident Symposium. Dallas, April, 2015. Cosmeceuticals & Microneedling. American Society of Dermatologic Surgeons. Resident Symposium. Dallas, April, 2015. Energy-based Aesthetic Therapies for Skin and Tissue Tightening and Lifting. Paradigm Medical Communications, World Congress of Dermatology. Vancouver. June 9th, 2015. Advances in Energy-Based Nonsurgical Tissue Lifting. Historical Persepctives, Practical Applications and Clincal Pearls. Paradigm Medical Communications, World Congress of Dermatology. Vancouver. June, 10th, 2015. FACIAL AESTHETICS: Advanced Techniques for Full Face Rejuvenation. Paradigm Medical Communications, World Congress of Dermatology. Costa Mesa, CA. May, 2015. FACIAL AESTHETICS: Advanced Techniques for Full Face Rejuvenation. Paradigm Medical Communications, World Congress of Dermatology. Berkeley, CA. April, 2015. Skin Tightening and Fat Melting, My Experience & A Review of The Literature. American Society of Dermatologic Surgeons. Resident Symposium. Dallas, April, 2015. Microfocused Ultrasound –my experience and a review of the literature. Fabi, SG. DUBAI DERMA – Dubai, UAE. April 5th, 2015. Global Rejuvenation with Combination Treatments for Natural Looking Results – Anti-Aging Medicine World Congress – Monaco, Montecarlo. March 26th, 2015. Skin Tightening: How to Optimize Results. COLCOME III SYMPOSIUM. Bogota Colombia, October 2014. 3-Dimensional Rejuvenation of the Aging face, Safe and Effective Treatment Combinations. COLCOME III SYMPOSIUM. Bogota Colombia, October 2014. Photofractional treatment. COLCOME III SYMPOSIUM. Bogota Colombia, October 2014. Moderator: Resident Mini-symposium Part 1. Annual Meeting of the American Society of Dermatologic Surgery. San Diego, November 2014. Moderator: Resident Mini-symposium Part 2. Annual Meeting of the American Society of Dermatologic Surgery. San Diego, November 2014. What Works and What Doesn’t for Fat and Skin Tightening? Annual Meeting of the American Society of Dermatologic Surgery. San Diego, November 2014. Life and Rejuvenate: Microfocused Ultrasound Plus Ablative Fractionated Laser. Annual Meeting of the American Society of Dermatologic Surgery. San Diego, November 2014. Advances in Energy-Based Nonsurgical Tissue Lifting. Historical Persepctives, Practical Applications and Clincal Pearls. Paradigm Medical Communications. Chicago, IL. September 2014. Skin Tightening: How to Achieve Maximum Results. Master of Aesthetics Meeting. San Diego, CA. August 2014. Laser Assisted Drug Delivery: How to Do It and Conquer Difficult Treatment Conditions. Master of Aesthetics Meeting. San Diego, CA. August 2014. 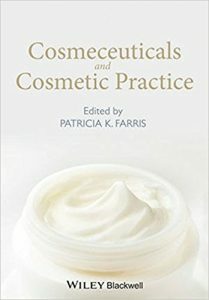 Cosmeceuticals: Practical Tips to Enhance Your Practice. Master of Aesthetics Meeting. San Diego, CA. August 2014. Growth Factors and Cytokines…The Concept, The Evidence, and The Clinical Relevance. The Aesthetic Show. San Diego, CA. July 2014. The Rationale for Integrating Photofractional Therapy into your Practice. The Aesthetic Show. San Diego, CA. July 2014. Ask the Experts – Panel discussion. Fabi SG and Patel T. Annual FACE meeting. London, UK. June 2014. Microfocused Ultrasound –my experience and a review of the literature. Fabi, SG. Annual FACE meeting. London, UK. June 2014. Microfocused Ultrasound –my experience and a review of the literature. Fabi, SG. 17th Annual RADLA meeting. Santiago, Chile. May 2014. Session with the Masters Fabi, SG. 26th Brazilian Congress of Dermatologic Surgery. Porto Alegre, Brazil. April 2014. Microfocused Ultrasound –my experience and a review of the literature. Fabi, SG. 26th Brazilian Congress of Dermatologic Surgery. Porto Alegre, Brazil. April 2014. Laser Resurfacing – Laser Review and Clinical Pearls for Residents and Fellows Workshop. 34th Annual American Society for Laser Medicine & Surgery Meeting. Phoenix, AZ. April 2014. 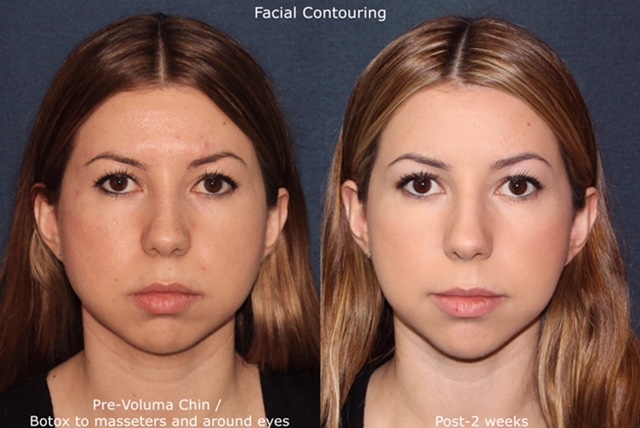 Retrospective Evaluation of the Ulthera System for Lifting and Tightening of the Face and Neck. Fabi SG, Goldman MP. 34th Annual American Society for Laser Medicine & Surgery Meeting. Phoenix, AZ. April 20134. Prospective Multicenter Pilot Study of the Safety and Efficacy of Micro-focused Ultrasound with Visualization for Improving Lines and Wrinkles of the Décolleté. Fabi SG, Goldman MP, Dayan S, Kilmer S, Gold M. 34th Annual American Society for Laser Medicine & Surgery Meeting. Phoenix, AZ. April 2014. Course Director & Moderator for Injectable and Laser Live Patient Demonstration – Academy of Cosmetic Surgery Annual Meeting – Fort Lauderdale FL. January 17th, 2014. Multi-center Evaluation of Transcutaneous Microfocused Ultrasound System (TMUS) for the Treatment of the Décolleté. Fabi, SG. Dayan S, Gold M, Kilmer S, Goldman MP. Academy of Cosmetic Surgery Annual Meeting – Fort Lauderdale FL. January 16th, 2014. Into Africa: Attacking Malaria & Leprosy. Fabi, SG. Academy of Cosmetic Surgery Annual Meeting – Fort Lauderdale FL. January 18th, 2014. Multi-center Evaluation of Transcutaneous Microfocused Ultrasound System (TMUS) for the Treatment of the Décolleté. Fabi, SG. Dayan S, Gold M, Kilmer S, Goldman MP. Annual Meeting of the American Society of Dermatologic Surgery. October 2013. Research Luncheon Session: The Article I Read This Year that I Learned the Most. Fabi, SG. Annual Meeting of the American Society of Dermatologic Surgery. October 2013. Skin Tightening: Impressed Yet? Fabi, SG, Annual Meeting of the American Society of Dermatologic Surgery. October 2013. Medical Triaging and the Tips for the Clinical Assistant in the Cosmetic Dermatology Practice. Fabi, SG,Annual Meeting of the American Society of Dermatologic Surgery. October 2013. Microfocused Ultrasound –my experience and a review of the literature. Fabi, SG. Cosmetic Update Annual Meeting – Vancouver, Canada. April 20th, 2013. The effect of multiple sequential light sources to activate aminolevulanic acid in the treatment of acne vulgaris. Fabi SG, Friedmann D, Goldman MP. 33rd Annual American Society for Laser Medicine & Surgery Meeting. April 5, 2013. The effect of multiple sequential light sources to activate aminolevulanic acid in the treatment of actinic keratoses. Friedmann D, Fabi SG, Goldman MP. 33rd Annual American Society for Laser Medicine & Surgery Meeting. April 5, 2013. The effect of multiple sequential light sources to activate aminolevulanic acid in the treatment of photodamage.Goldman MP, Friedmann D, Fabi SG. 33rd Annual American Society for Laser Medicine & Surgery Meeting. April 5, 2013. The effect of multiple sequential light sources to activate aminolevulanic acid in the treatment of rosacea. Friedmann D, Fabi SG, Goldman MP. 33rd Annual American Society for Laser Medicine & Surgery Meeting. April 5, 2013. 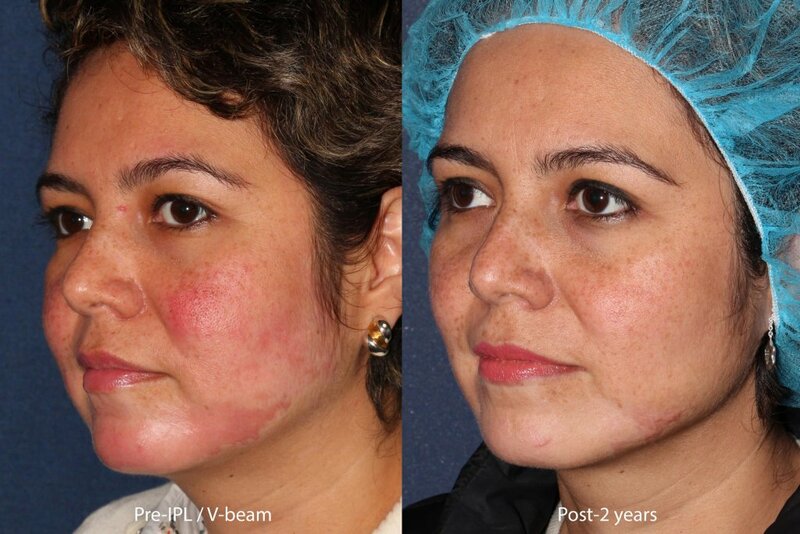 A randomized, split-face clinical trial of low-fluence q-switched neodymium-doped ytturium aluminum garnet (1064nm) laser vs low-fluence q-switched alexandrite laser (755nm) for the treatment of facial melasma: preliminary results. Fabi SG, Friedmann D, Massaki A, Goldman MP. 33rd Annual American Society for Laser Medicine & Surgery Meeting. April 5, 2013. A prospective comparative trial of high-intensity focused ultrasound vs cryolipolysis for treatment of flank subcutaneous adipose tissue. Mahoney L, Friedmann D, Fabi SG, Goldman MP. 33rd Annual American Society for Laser Medicine & Surgery Meeting. April 7, 2013. Annual Meeting – Las Vegas. January 19th, 2013. Microfocused Ultrasound –my experience and a review of the literature. Fabi, SG. Academy of Cosmetic Surgery Annual Meeting – Las Vegas. January 18th, 2013. Course Director & Injector Injectable and Laser Live Patient Demonstration – Academy of Cosmetic Surgery Annual Meeting – Las Vegas. January 17th, 2013. Evaluation of the Ulthera System for Lifting and Tightening the Decolletage. Fabi SG, Massaki A, Goldman MP. 32nd Annual American Society for Laser Medicine & Surgery Meeting. April 22, 2012. Pathophysiology of Varicose and Telangiectatic Veins and Mechanism of Action of Sclerotherapy. Fabi, SG. Loma Linda University Medical Center – Core Curriculum Lecture Series and Live Patient Demonstration March 2012. Injector- Injectable and Laser Live Patient Demonstration – Academy of Cosmetic Surgery Annual Meeting – Las Vegas. January 13th, 2012. Clinical Efficacy and Safety Evaluation of the New Monopolar Radiofrequency (mRF) Device With Comfort Pulsed Technology for the Treatment of Facial Skin Laxity: a 10 Month Experience With 64 Patients. Fredeking A, Fabi SG, Massaki A, Goldman MP. Annual Meeting of the American Society of Dermatology Surgery. November 2011. Poly-L-Lactic Acid for Chest Rejuvenation: A Retrospective Study of 28 Cases Using a 5-point Chest Wrinkle Scale. Fabi SG, Bolton J, Peterson J, Goldman MP. Annual Meeting of the American Society of Dermatology Surgery. November 2011. Society of Dermatology Surgery. November 2011. A Two-Center, Open-Label, Randomized, Split-Face Study to Assess the Efficacy of One Versus Three Intradermal Injection Sites of Abobotulinum toxin A in the Treatment of Lateral Periocular Rhytides. Annual Meeting of the American Society of Dermatology Surgery. Fabi SG, Sundaram H, Goldman MP, Guiha I. November 2011. Surgery. Fabi, SG. October 2011. A Split-Face Study Investigating Hexyl Aminolevulinate HCl Combined With Multiple Laser and Light Sources For Photorejuvenation.Fabi, SG, Peterson JD, Goldman MP. 31st Annual American Society for Laser Medicine & Surgery Meeting. April 3, 2011. Sclerotherapy. Fabi SG. Univerisity of Illinois School of Medicine – Dermatology Grand Rounds. May 2010.
making the diagnosis difficult. Fabi SG, Aronson IK, Bernes R. 68th American Academy of Dermatology Annual Meeting, Gross & Microscopic Dermatology Symposium, Miami, FL, Mar 5, 2010. Cutaneous leismaniasis. Fabi SG, Chan L. Chicago Dermatological Society Meeting, December 9, 2009. Actinic prurigo. Fabi SG, Aronson IK. Chicago Dermatological Society Meeting, December 10, 2008. Focal epithelial hyperplasia (Heck’s disease). Fabi SG, Bain M. Chicago Dermatological Society Meeting, December 10, 2008. Summer Meeting, Gross & Microscopic Dermatology Symposium, Chicago, IL, Aug 2, 2008. Juvenile & Adult Dermatomyositis. Fabi SG, Aronson IK. Chicago Dermatological Society Meeting, December 12, 2007. Randomized, double-blind, head-to-head, split face study comparing tranexmic acid in a novel transdermal delivery system to hydroguinone for improvement of melasma. Open Label Study Assessing the Effecacy and Tolerability of Even Up and mineral-based make-up brushes following Intense Pulsed Light Treatment. A Multicenter, Double-blind, Non-treatment, Long‑term Follow‑up Study of Subjects who Completed ATX-101 (Deoxycholic Acid Injection) Clinical Trials ATX‑101‑11‑22 for the Reduction of Localized Subcutaneous Fat in the Submental Area. VeClose Clinical Investigation Plan VenaSeal Sapheon Closure System vs.
Clinical Study: A Side-by-Side Comparison of the Velashape II and a Cold Laser Device for the Reduction of Thigh, Hip, and Waist Circumference. 2010 Obagi Medical Products, LLC. Clinical Study: Evaluating Patient Satisfaction of Obagi Condition & Enhance System for Non-Surgical Procedures Compared with a Placebo Regimen in Individuals Undergoing Injectable Hyaluronic Acid Filler to the Nasolabial Folds. Principal Investigator: Dr. N. Joseph Espat. Researched the effects of n-3 lipids on levels of Insulin Growth Factor in the context of tumor cell proliferation. Principal Investigator: Dr. Richard Sikai. Researched the parasitology, immunology, entomology, and epidemiology of Malaria, in hope of acquiring more knowledge to aid in the development of a future vaccine. Jones I, Radusky RC, Fabi SG. (2016) Approaches to Hand Rejuvenation. In Lawrence N Dermatologic Surgery. McGraw-Hill. Bolton J, Fabi SG. (2016) Complications of Temporary Fillers. In Carruthers J & Carruthers A, Soft Tissue Augmentation 4th Edition. London: Elsevier Publishers LTD.
Vanaman M, Fabi SG. (2016). Neck and Chest In Carruthers J & Carruthers A, Soft Tissue Augmentation 4th Edition. London: Elsevier Publishers LTD.
Wieczorek I, Fabi SG, Carruthers J. (2016). Lip Augmentation In Carruthers J & Carruthers A, Soft Tissue Augmentation 4th Edition. London: Elsevier Publishers LTD.
Fabi SG, Wu D. (2016) Rejuvenation of the Aging Chest. In Sadick N, Rejuvenation of the Aging Body. London: JP Medical Publishers LTD.
Fabi, SG, Goldman MP. (2013) Fillers (HAs & Radiesse). In Karam A and Goldman MP, The Aging Face: A comprehensive approach to treatment. London: JP Medical Publishers LTD.
Peterson JP, Fabi, SG, Friedmann D. Nonablative Fractionated Lasers. In Karam A and Goldman MP, The Aging Face: A comprehensive approach to treatment. London: JP Medical Publishers LTD.
Fabi SG, (2013). Nonablative Fractionated Lasers. In Jagdeo J, ASDS Laser Primer. Fabi SG. (2013). Intense Pulsed Light. In Jagdeo J, ASDS Laser Primer. Fabi SG, Sundaram H (2013). Growth Factors in Cosmeceuticals. In Farris P, Cosmeceuticals. New Jersey: Wiley. Goldman M, Fabi SG, Wojtczak JG (2012). Anesthesia. 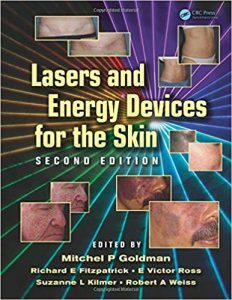 In Goldman MP, Lasers and Energy Devices for the Skin(2nd ed.). London: Informa Healthcare. Goldman M, Peterson JD, Fabi SG, (2012). Cellulite. In Goldman MP, Lasers and Energy Devices for the Skin(2nd ed.). London: Informa Healthcare. Palm M, Massaki A, Fabi SG, Goldman MP. (2012) Laser Lipolysis. In Goldman MP, Lasers and Energy Devices for the Skin(2nd ed.). London: Informa Healthcare. Reviewed, Goldman MP, Guex JJ, Weiss RA (2011) Sclerotherapy Treatment of Varicose and Telangiectatic Leg Veins: Fifth Edition. London: Elsevier 2010.